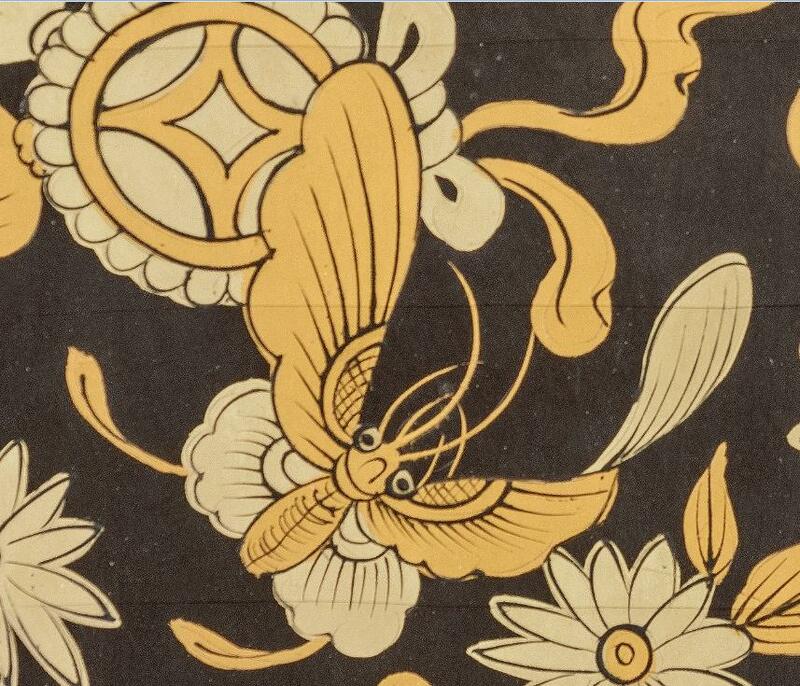 If you read the Winterthur Blog about a year ago, you may have stumbled across the post A Brittle Beauty and discovered that the treatment of Winterthur’s Chinese export lacquer has been part of an ongoing IMLS grant that began back in 2012. 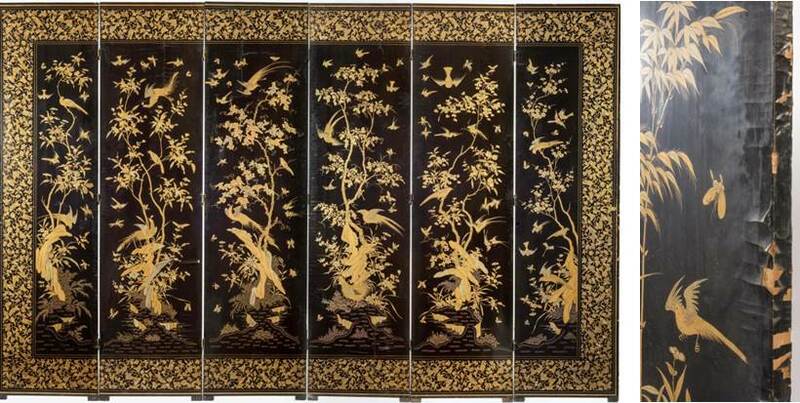 Shortly after that posting, I became immersed in the world of Chinese export lacquer, its beauty, and its challenges. 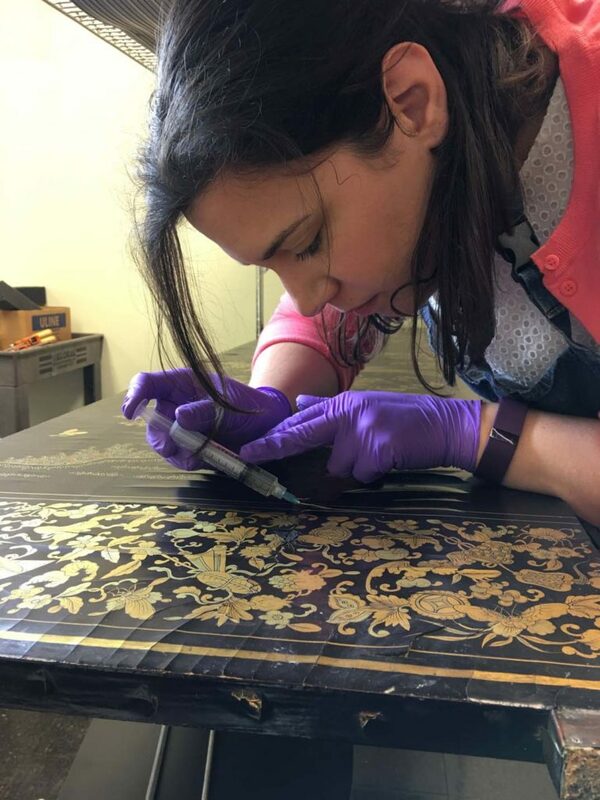 When I began my fellowship at the end of September 2015, my fellow furniture conservators had spent the last two years being trained on the conservation of lacquer. Aiming to expose me to as many aspects of lacquer treatment as possible, they had set aside a six-panel lacquer screen as my main project. This piece was meant to be an easy treatment scheduled to be completed in a few months. An overall image of the screen before treatment, with a detail of the lifting, cracking, and loss along one panel’s edge. Left: photo courtesy of Gilles Auffret. Right: photo courtesy of Jim Schneck. One of the things that I love about the field of art conservation is that there is always, always, an “easy” object out there just waiting to challenge you, to make you rethink your treatment plan, and to make you grow as a conservator. I should have known from the beginning that this screen would be that piece. Even the butterfly in the decoration seemed cautious. Wary butterfly from the screen 2004.30.2. Clearly he knew something I didn’t about how less than straightforward this treatment would be. The standard consolidation technique that we had used on other objects in the collection proved to be too risky for my screen. Other objects in the collection had been varnished with a natural resin at some point in their history to resaturate the degraded lacquer surface (a common historical practice that causes its own set of conservation problems). This varnish coating effectively protected the lacquer surface from excess adhesive during consolidation. My screen was never coated and had no barrier between the consolidating adhesive and the lacquer surface, making staining a very real and very scary, risk. Combine that with a surface that is highly sensitive to almost every solvent that had been used in lacquer treatments at Winterthur so far, and the potential for irreversible damage seemed inevitable. Fortunately, with the guidance of experts in both lacquer conservation and conservation science, we were able to design a technique that would help protect the surface while still allowing consolidation to occur. I applied a barrier layer of a solvent that does not stain the surface, has a long evaporation time, and is of a different polarity to the adhesive. This means that any glue that may come out during the glue up will sit on top of the solvent surface rather than be wicked onto the lacquer (think of a drop of water on oil). Unlike a varnish or resin coating, this barrier layer evaporated on its own rather than needing to be removed. I also switched the adhesive I was using to one that was more fluid, which allowed me to use a thinner needle and have more control over injection. As you can see from the images, the barrier layer was extremely successful! Flakes could be laid down successfully without damaging the lacquer surface. While this treatment has taken a few months longer than originally predicted, knowing that screen is more stable and at less risk for losing flakes has been incredibly rewarding. I’ve learned many new techniques just working on this one material over the past year, and I am looking forward to applying that knowledge towards my future endeavors. 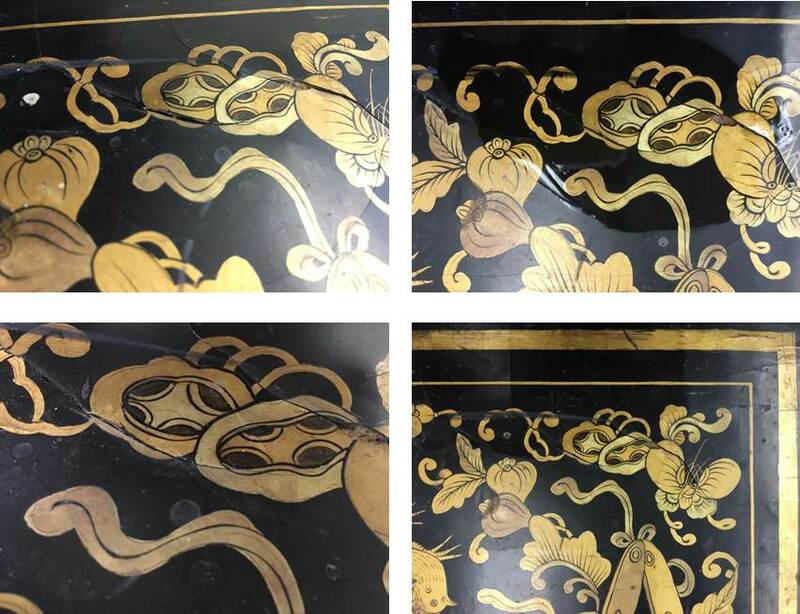 This entry was posted in Academic Programs, antiques, Art Conservation, Behind-the-Scenes, Conservation, Decorative Arts, museum collection, Students & Alumni, Uncategorized and tagged antiques, conservation, lacquer, Winterthur Museum Garden & Library, Winterthur Program in American Material Culture. Bookmark the permalink.